As much as 14-year-old Zanna loves her twin brother, Martin, and her dad, she is absolutely certain that a vacation with them in the remote Alberta icefields – sans e-mail or television - will be boring and dreary, at best. She would much rather be in Paris with her mom, checking out the French culture and cuisine scene. When Martin saves a wild puppy near their isolated Alberta cabin, Zanna names it “Paris ” and falls in love with it, but a know-it-all forest ranger insists that it’s a wolf. Zanna reluctantly agrees to leave it at the nearest wolf haven … and wonders if her summer will get any worse. Unfortunately, it does – Martin goes missing in the wilderness. Frantic with worry, Zanna and her father enlist the help of Paris, hoping that the wolf puppy’s sensitive nose will lead them to Martin in time. Last Chance for Paris offers teen readers an enjoyable combination of wilderness / survival novel and romance story, one that can be easily enjoyed by readers who may usually be uninterested in adventure or animal tales. Strong, realistic characterization, a suspenseful plot, wry humour, and a poignant message about family ties are all evident in this excellent teen novel. Author Sylvia McNicoll has a number of young adult books to her credit, and she is also the Features Editor of Today’s Parent Toronto. ** Recommended for ages 12 to 15 years of age. Find this item in the PCIN Library Catalogue. Later that night, he awoke, looked out his bedroom window and saw that his wish had come true. He could see a large, stately castle on the beach. Jack entered and sat upon a seashell throne. “Hail, King Jack!” cheered the crowd. But in the merriment that followed, no one heard the large waves washing against the walls until they gave way and the sea rushed in. The courtiers became sea creatures, while Jack escaped to the highest tower and from there, to safety. British author and illustrator M.P. Robertson has created a hauntingly exquisite story which isn’t easily forgotten. Can any human power – or magical power - ever be greater than the strength of the sea and of nature? M.P. Robertson is also the creator of The Egg, The Great Dragon Rescue, The Dragon Snatcher and various other picture books for children. ** Recommended for ages 3 to 6 years of age. Emma-Jean Lazarus did, indeed, fall out of a tree… both physically and metaphorically. Her sore ribs recovered quickly from the tumble. However, her “fall” from a well-ordered, logical world into a less certain world of changes, growing up and relationships, was not so quickly resolved. Emma-Jean was the smartest girl at William Gladstone Middle School. She was also known as one of the strangest girls there. Emma-Jean didn’t care about that, knowing that “strange” can mean “unique” and “remarkable”. She was quite satisfied with her life, until she found Colleen Pomerantz crying in the girls’ room and decided to help her, thereby setting in motion a complicated, unforeseen chain of events. Suddenly, Emma-Jean’s life – both at school and at home - became just plain …. messy! Lauren Tarshis’ first novel is a very enjoyable read which contains a world of wisdom. It has much to say to girls of middle school age about self-acceptance, empathy, honesty, courage and dealing with bullies. The characters are very realistic, and the author uses a “spare” style of text that appears quite polished. What’s the best thing about this book? The answer: a sequel is planned! An interview with the author is included at the back of the book. ** Recommended for ages 9 to 12 years of age. What better project for a summer day than building a backyard treehouse? Follow Jack and Jill as they fetch some boards of wood, haul them up to a sturdy branch, and fashion them into a roof and a floor. Watch them drape a large, colourful blanket over the roof and down the sides, and, as a final touch, hang a flashlight from the roof. Now Jack and Jill have a wonderful, cozy treehouse … much more fun than fetching a pail of water and falling down the hill with it! Pamela Edwards’ charming picture book, illustrated by Henry Cole, is a cumulative read-aloud, or “pattern book”. (“This is the branch that held the treehouse that Jack and Jill built. 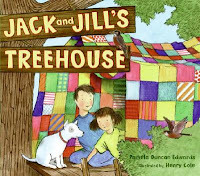 This is the wood that was hauled up to the branch that held the treehouse that Jack and Jill built….”) A pattern book invites young listeners to join in with the repeating phrases and even to “read” the book later on their own, using the accompanying illustrations – a beginning step in learning how to read. Pamela Edwards, from Virginia, is the author of many children’s picture books, many of them illustrated with Henry Cole’s delightful pictures. Recommended for ages 3 to 6 years of age. Michael Tucker and his wife Jill Eikenberry are probably best known from their time on LA Law, but about five years ago they gave up their Californian lifestyle to buy a 300-year-old cottage in Spoleto, Umbria, complete with its own olive grove and 400-year-old forno, or outdoor oven. 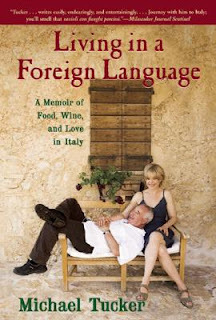 This memoir is a little about their life in Umbria, a little about their relationship and attempts to learn Italian, a little about the ex-pats and local Italian people that they meet along the way and a lot about the food. Barely a page goes by without a detailed description of some fantastically simple Italian dish, how it is prepared, its ingredients, how it tastes – the Margherita pizza, the strengozzi al tartufo, the fresh cheese drizzled with chestnut honey – you could gain 20 pounds just from reading this book, and it is sure to have its readers either making reservations for Italian food or for a flight to Italy. What comes through the most is the author’s near reverence for the freshness of their food and for the gently-passing, conversation-filled meal-times shared with his beloved wife and dear friends, as opposed to the grab-and-gulp frozen meals eaten in North America. Those who have been to Italy will love this book, and for those who just dream of going this book brings it all the way to your door – you can almost smell the mortadella on every page.